Nail Polish Wars: Stripe It Up! Hi everyone! I recently snagged a few polishes from the new Ornate Collection from Zoya. I was so excited to use them, so here's what I decided on! I started with three coats of Zoya Aurora, a beautiful violet jelly, loaded with holographic particles. Two coats might have done the trick, but there was still a very faint VNL, so I added one more. I then followed with one coat of SV. As amazing as this polish is, Aurora will show you a whole new speed when you take her out into the sunlight! 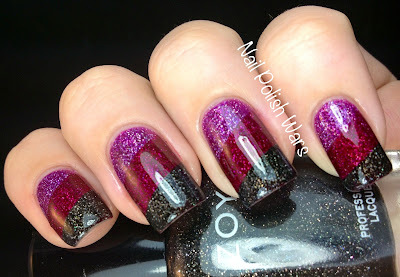 I taped off the upper section of my nail and added one coat of Zoya Blaze, a deep red jelly, loaded with holographic particles. Blaze is another absolutely dazzling polish. I followed it with another coat of SV. I had to take it out in the sunlight as well. Lastly, I taped off the section midway down my lower nail and applied one coat of Zoya Storm, a black jelly, loaded with holographic particles. I finished it off with one final coat of SV. And, of course, I had to have a look at the finished project out in the sun. I am absolutely crazy about this trio from the Ornate Collection. The formulas are perfectly smooth, making application a dream. I hope you all enjoyed it! Love it!! Super cute! I love Storm, Blaze and Aurora, I am currently wearing all three of them! Gorgeous Mani, The colors are awesome. So pretty! GORGEOUS!!! I have the exact same three and love them all ! I have on Blaze now! I did the same thing and went out in the sunlight!!! Simply Magnificent!!! Oooooohhhhhhh drooool!!! These are the exact three that I was going to get!!!! They are sooo beautiful!!! My kind of candy corn!! Beautiful mani! I love this collection. It's rare that a collection is released and I like EVERY polish. Can we just agree that your nails are perfection and never speak of this again?))) I love the purple and red together! This is the sweetest and funniest comment I have ever received!! Thank you so much!!!!! This is so beautiful! The polishes look great together! These are my 3 favorites and they look great together in this mani!! Lovely colours! They suit each other so well. Mmh!